3Department of Agronomy and Plant Breeding, College of Agriculture, Shahid Bahonar University of Kerman, Kerman, Iran. In order to study the genetic conditions of some agronomic traits in wheat, a cross was made between Gaspard and Kharchia varieties. F2, F3 and F4 progenies with parents were evaluated under drought conditions. Three-parameter model [m d h] considered as the best fit for number of fertile tiller and flag leaf length using generations mean analysis method. For number of grain per spike and main spike grain weight three-parameter model [m d i] was used. For number of spikelet per spike, grain yield and plant height four-parameter model [m d h i] was used. The heritability values ranged from 56% for flag leaf length to 81% for grain yield. The F3 generation with 100 individuals was used to construct a genetic linkage map. Using the method of composite interval mapping 3, 1, 5, 2, 2 and 1 QTLs were detected for plant height, grain yield, number of spikelet per spike, flag leaf length, main spike grain weight and number of fertile tiller respectively. Akhtar, N. and Chowdhry, M.A. 2006. Genetic analysis of yield and some other quantitative traits in bread wheat. Intern. J. Agri. Biol, 4: 523-527. Borner, A., Schumann, E., Furste, A., Coster, H., Leithold, B., Roder, M.S. and Weber, W.E. 2002. Mapping of quantitative trait loci determining agronomic important characters in Hexaploid wheat. Theor Appl Genet, 105: 921-936. Dashti, H., Bihamta, M.R., Shirani, H. and Majidi, M.M. 2007. Genetic analysis of salt tolerance in vegetative stage in wheat (Triticum aestivum). Plant omics, 5(1):19-23. Elouafi, M. and Nachit, M.A. 2004. genetic linkage map of the Durum × Triticum dicoccoides backcross population based on SSRs and AFLP markers, and QTL analysis for milling traits, Theor Appl Genet, 108: 401-413. Erkul, A., Unay, A. and Konak, C. 2010. Inheritance of yield and yield components in a bread wheat (Triticum aestivum L.) cross. Journal of Field Crops, 15(2): 137-140. Esmail, R.M. and Khattab, S.A.M. 2002. Genetic Behavior of Yield and its Components in Three Bread Wheat Crosses. J. Agric. Res, 27(2): 215 –224. Farag, H.I.A.2009. Inheritance of yield and its components in bread wheat (Triticum aestivum L.) using six parameter model under Ras Sudr conditions. 6th International Plant Breeding Conference, Euphytica, 90-112. Fethi, B. and Mohamed, E.G.2010. Epistatic and genotype by environment interaction of grain yield related traits in durum wheat. J. Plant Breed. Crop Sci, 2(2): 24-29. Frozanfar, M., Bihamta, M., Payghambari, A. and Zeynali, H.2009. 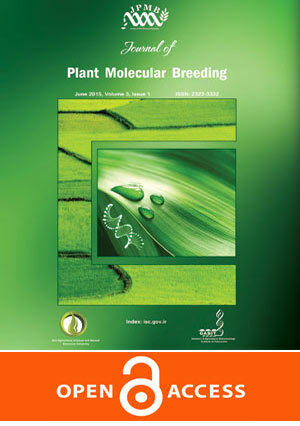 Inheritance of some Traits Associated with Yield in Bread Wheat Using Generation Mean Analysis.Seed and plant improvement journal,1 (25):419-431. Hodges, T. 1991.Predicting crop phenology. CRC Press, Boca Raton, USA. Huang, X.Q., Cloutier, S., Lycar, L., Radovanovic, N., Humphreys, D.G., Noll, J.S., Somers, D.J. and Brown, P.D.2006. Molecular detection of QTLs for agronomic and quality traits in a doubled haploid population derived from two Canadian wheats (Triticum aestivum L.), Theor Appl Genet, 113: 753–766. Ibrahim, M., LydiaElias, W. and Mohamednajeb, B. 2011. Identification of RAPD and ISSR markers associated with flag leaf senescence under water stressed conditions in wheat (Triticum aestivum L.). Aust J Crop Sci, 5(3):337-343. Ibrahim, S.E., Schubert, A., Pillen, K. and Leon, J.2012. Comparison of QTLs for drought tolerance traits between two advanced backcross populations of spring wheat. Int. J. AgriScience, 2(3):216-227. Jansen, R. 1993. Interval mapping of multiple quantitative trait loci. Genetics, 135: 205–211. Jansen, R. and Stam, P.1994. High resolution of quantitative traits into multiple loci via interval mapping. Genetics, 136: 1447–1455. Kamboj, M.C., Subhadra, N.C. and Yadava, R.K.2000. Genetic analysis of yield and its components in bread wheat (Triticum aestivum L.). Ann. Agri. Bio. Res, 5: 41-43. Khaled, M.A.I.2007. Estimation of genetic variance for yield and yield components in two bread wheat (Triticum aestivum L.) crosses. J. Agric. Sci, 32(10):8043-8053. Khattab, S.A.M., Shaheen, A.M.A. and Afiah, S.A.N.2001. Genetic behavior of some metric traits in four bread wheat crosses under normal and saline conditions. J. Agric. Sci, 26 (1): 217-229. Kosambi, D.D.1944. The estimation of map distances from recombination values. Ann. Eugen 12: 172-175. Kumar, G.P., Singh, B.H., Laxminarayan, K.P., Kumar, N., Kumar, A., Rouf, M.R., Mohan, A. and Kumar, J.2007. QTL analysis for some quantitative traits in bread wheat, J Zhejiang Univ Sci B, 8: 807-814. Maccaferri, M., Sanguineti, M.C. and Corneti, S. 2008. Quantitative trait loci for grain yield and adaptation of durum wheat (Triticum durum Desf.) across a wide range of water availability. Genetics, 178: 489-511. Mather, K. and Jinks, J.L. 1982. Introduction to biometrical Genetics. 3 rd. ed Chapman and Hall, London. 396p. Mathews, K.L., Malosetti, M., Chapman, S., McIntyre, L., Reynolds, M., Shorter, R. and Vaneuwijk, F.2008. Multi-environment QTL mixed models for drought stress adaptation in wheat. Theor. Appl. Genet, 117:1077-1091. McIntyre, C.L., Mathews, K.L., Rattey, A., Chapman, S.C., Drenth, J., Ghaderi, M., Reynolds, M. and Shorter, R.2009. Molecular detection of genomic regions associated with grain yield and yield-related components in an elite bread wheat cross evaluated under irrigated and rainfed conditions. Theor. Appl. Genet,120:527-541. Mehla, B.S., Sharma, S.C. and Hooda, J.S.2000. Gene action for certain quantitative traits in wheat. Ann. Agric. Biol, 6: 95-100. Mostafavi, K., Hassanzadeh, A. and Zeynalikhanghah, A.H.2005. Genetic Analysis of Yield and Correlated Traits in Bread Wheat (Triticum aestivum). Iranian Journal of Agricultural Sciences, 36 (1):187- 197. Ojaghi, J. and Akhundova, E.2010. Genetic analysis for yield and its components in doubled haploid wheat, J Agric Res, 5(4): 306-315. Quarrie, S.A., Quarrie, S.P., Radosevic, R., Rancic, D., Kaminska, A., Barnes, J.D., Leverington, M., Ceoloni, C. and Dodig, D.2006. Dissecting wheat QTL for yield present in a range of environments: from the QTL to candidate genes. J. Exp. Bot,57:2627-2637. Roder, M.S., Korzun, V., Wendehake, K., Plaocke, J., Tixier, M.H., Lerou, P. and Ganal, A. 1998. Microsatellite map of wheat. Genetics, 149: 2007-2023. Sambborook, J., Fritsch, E.F. and Maniattis, T.1989.Molecular cloning: A laboratory manual, Cold Spring Harbor laboratory. USA. Singh, G., Bhullar, G.S. and Gill, K.S.1984.Inheritance of plant height, days to heading, spike length, peduncle length and spikelet per spike in spring wheat cross, INDIAN J GENET PL BR, 44 (3):522-524. Singh, G., Nanda, G. and Shou, V.1998. Gene effects for grains per spike, grain weight and grains per spikelet in a set of nineteen crosses of wheat. INDIAN J GENET PL BR,1998, 58: 83-89. Singh, R.P. and Singh, S.1992. Estimation of genetic parameters through generation mean analysis in bread wheat. ‎Indian J. Genet, 52:369-375. Tanksley, S.D., Young, N.D., Paterson, A.H. and Bonierbale, M.1989.RFLP mapping in plant breeding: New tools for an old science. Biotech, 7: 257–264. Vonkorff, M., Grando, S., DelGreco, A., This, D., Baum, M. and Ceccarelli, S.2008. Quantitative trait loci associated with adaptation to Mediterranean dryland conditions in barley.Theor. Appl. Genet,117:653-669. Yadava, R.N., Maherchandani, M. and Singh, G.1995. Comparison of the observed and predicted frequencies of transgresive segregation for yield and related traits in two bread wheat population. INDIAN J GENET PL BR, 55(3):266-272. Zhang, L., Li, H., Li, Z.S. and Wang, J.2008. Interactions between markers can be caused by the dominance effect of QTL. Genetics, 180: 1177-1190. Zeng, Z.B.1994. Precision mapping of quantitative trait loci. Genetics 136: 1457-1468.